And here we are at the first of several Sourdough Rye breads in The Bread Baker’s Apprentice, bread number 31 of the BBA Challenge. 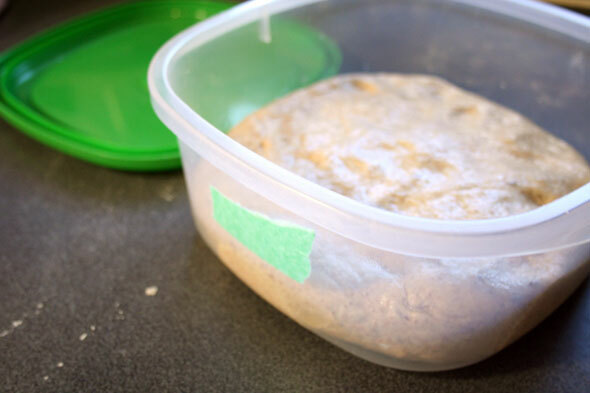 Before we do the normal Mis en Place, I mixed up what Reinhart called a “stiff starter” and for this bread, that meant a rye starter made into a pre-ferment. 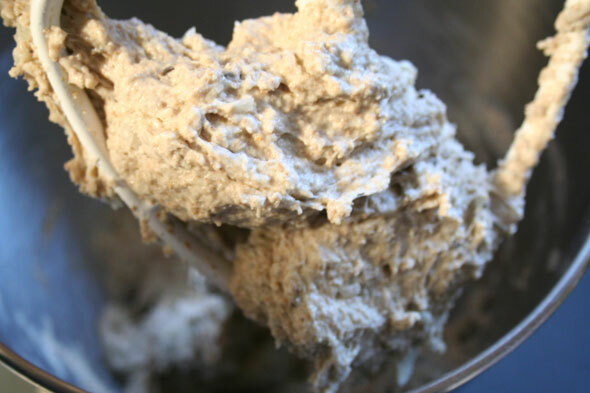 So first thing was to build a rye starter from my normal unbleached white wheat starter. According to the recipe this would require 7 oz (about a cup) of the rye starter. 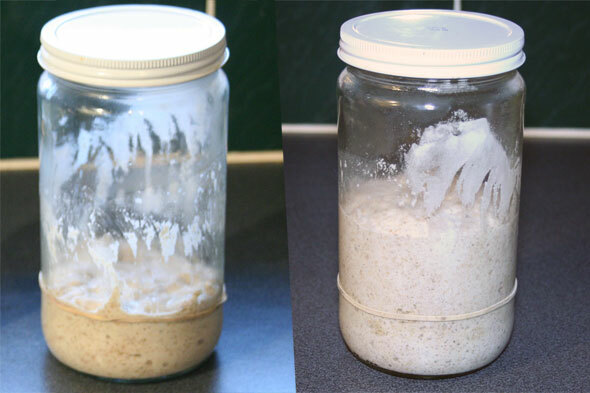 So on the day before I fed the new starter with rye flour and waited for it to double which it did in about 4 hours, as shown at left. Then I realized that the recipe I was about to make was enough for two 2-pound loaves or three 1.5 pound loaves, way more than I can get through in a week. 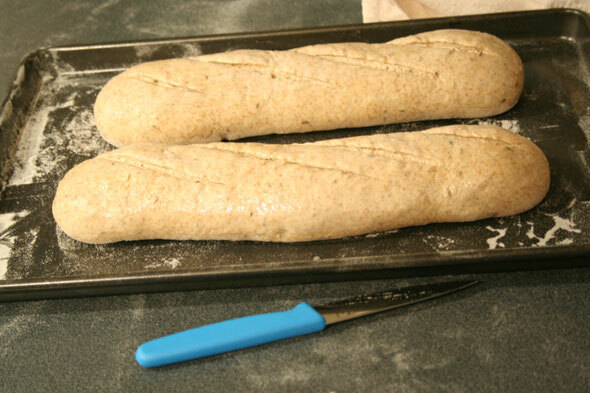 So from this point, I just halved all the ingredient quantities and would aim for two 1-pound loaves. 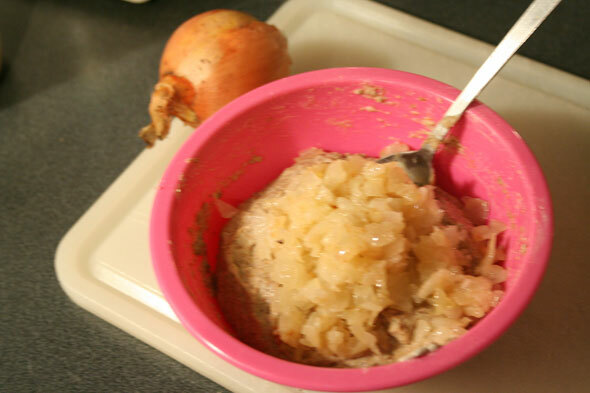 The next step was to cook up a diced onion and, once cooled, add it to (now just half) the rye “mother” along with more rye flour and water. This would then sit in a covered bowl until bubbly and foamy then go into the fridge overnight. 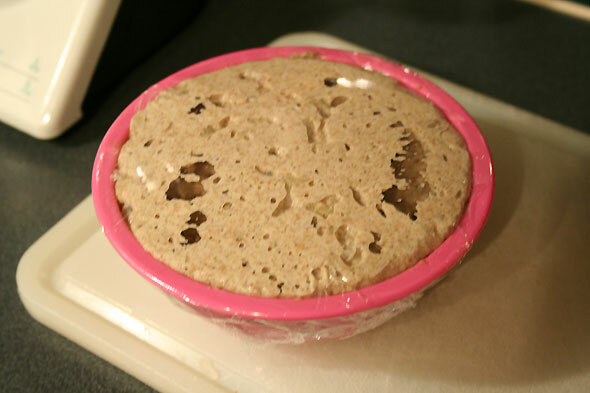 The next day, the foamy “stiff starter” is pulled from the fridge and allowed to warm up for one hour. 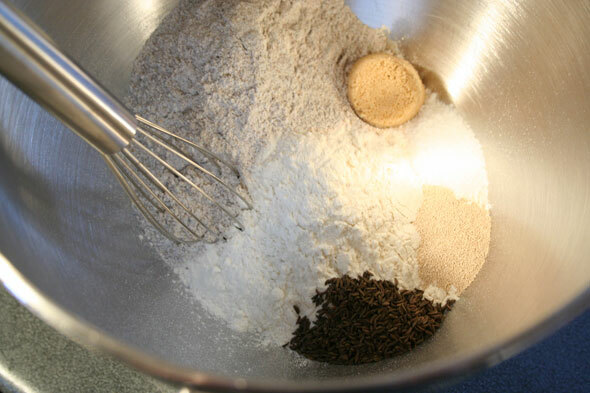 In this bread we’ll be mixing: bread flour, the stiff starter (rye sourdough + onions), and more rye flour. 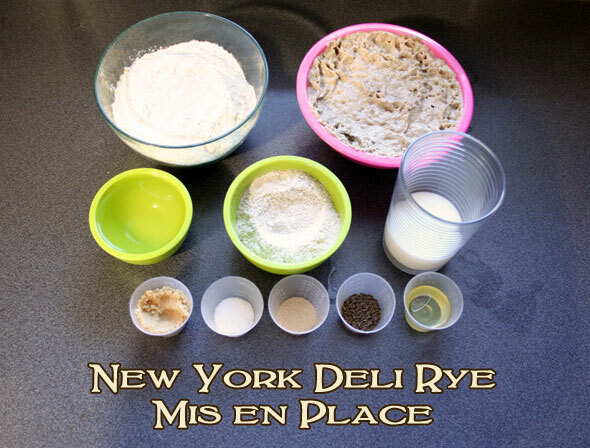 Note that the recipe calls for “white rye flour” which I’ve never seen for sale anywhere around here, so I’m going ahead and using the dark rye I have on hand. From what I can find, the difference is that the white right is lighter in both colour and flavour but the gluten aspect is the same: not much. We also have on hand about a half cup of water (use as required), buttermilk and, in the little bowls, brown sugar, salt, instant yeast, caraway seed and veg oil. Again, all these amounts are half of the quantities listed in the recipe. 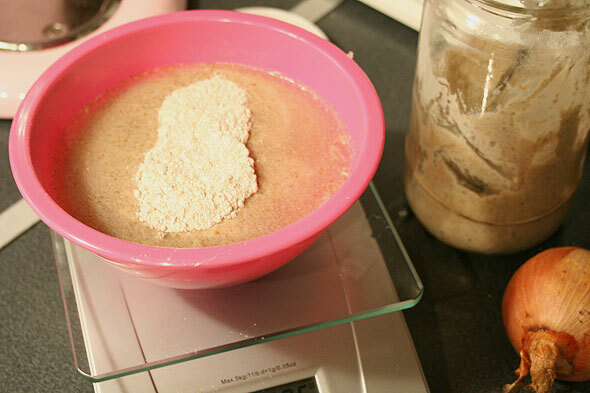 These next steps are pretty basic: mix dry ingredients, add liquids and mix with paddle until a rough ball forms. I only used about 1/4 cup of the water to get everything to come together. This is then allowed to sit for 5 minutes to rest. I thought this was a rather short autolyse period but it seems Reinhart doesn’t give his bread much autolyse time. 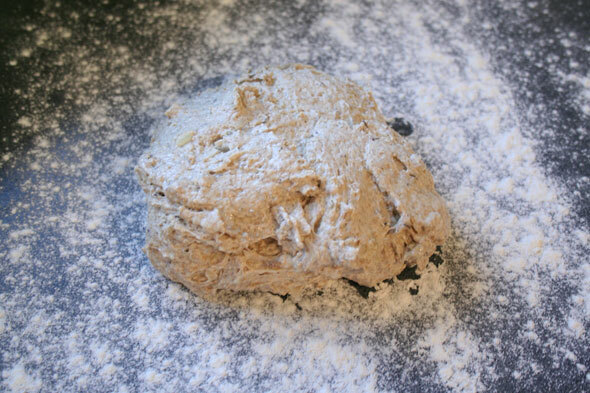 The dough is then turned out onto the floured countertop for kneading. You can use the dough hook and knead for about 4 minutes on medium low speed – I chose to knead by hand for six minutes instead. The dough was just a little tacky-gummy, being rye. At this point it was windowpaning pretty good. 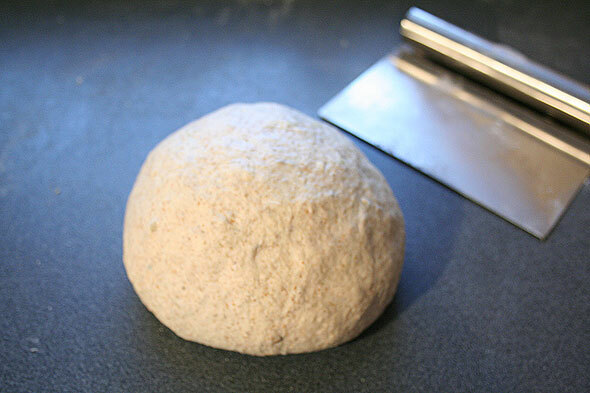 I also weighed the dough ball here and I was at 29.5 oz. 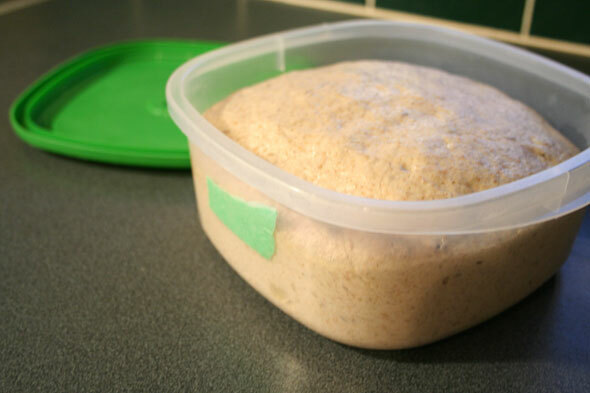 The dough is placed into an oiled bowl, covered and allowed to bulk proof until doubled, about 90 to 120 minutes. We got there at about 100 minutes. 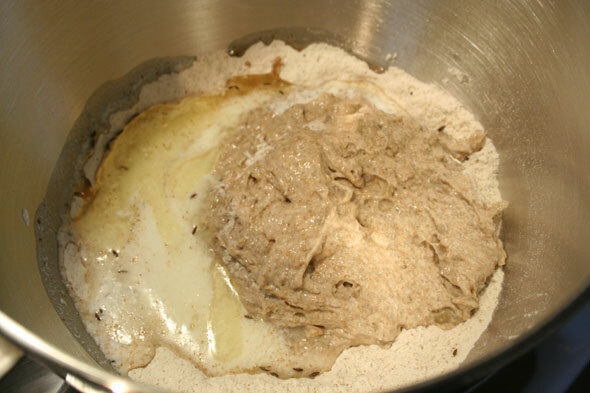 The dough is then turned out and divided, in this case into pieces of 14-15 oz each. 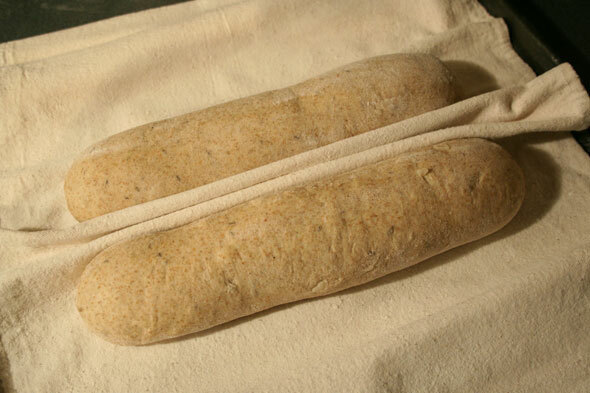 The dough is shaped; here I’ve chosen to make two batards. 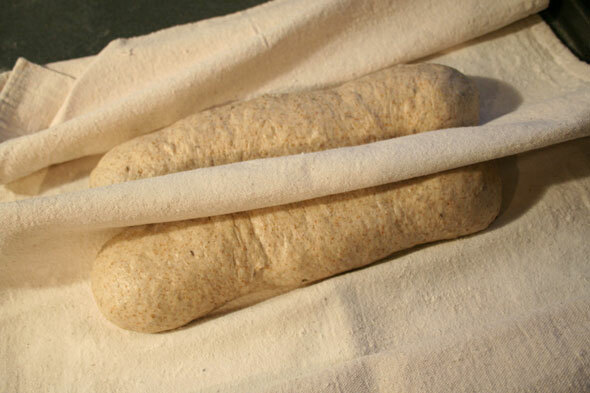 The loaves are put into the floured couche and allowed to rise until about 1.5 times the original size as seen on the right. This took a full 90 minutes. At the 60 minute mark, I preheated the oven set at 400ºF. Looking at these dough shapes, even after proofing, I was concerened that my decision to make two small 15 oz loaves would not be a good one, and that I would have been better off making one 30 oz loaf. We’ll see if this was really an issue later on and if the oven spring would help them out. The proofed loaves are then transferred to the baking sheet and given a glaze of slightly whisked up egg white, which I just happen to have leftover from making lemon meringue pie the day before. They looked lovely, although still a bit small so yes, I’d make a single larger loaf next time. 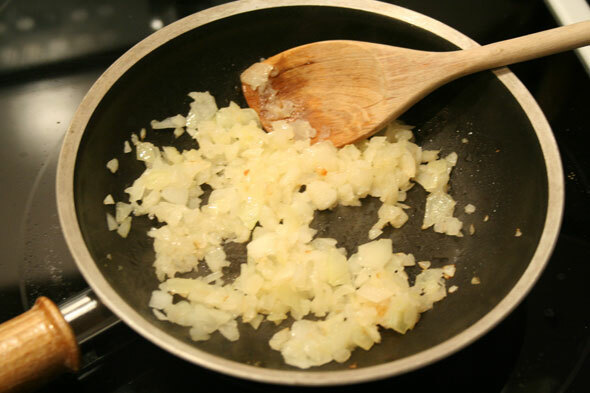 But the slashes were good, got some “gringe” action in there, the colour was a good, deep golden brown and the smell was lovely, the onion giving just a nice undertone and not too overbearing. The bread was allowed to cool for an hour and I was finally able to to slice it and check out the crumb and colour, a point of interest since I had used dark rye instead of white rye flour. Here’s our final Crumb Shot. Sorry, looks like it’s a bit out of focus. But the interior is still relatively light considering the flour, the crumb is even and somewhat small, as rye tends to be. The taste is very nice indeed, the onion and caraway are somewhat more subtle than I would have expected but still give a distinct hit. 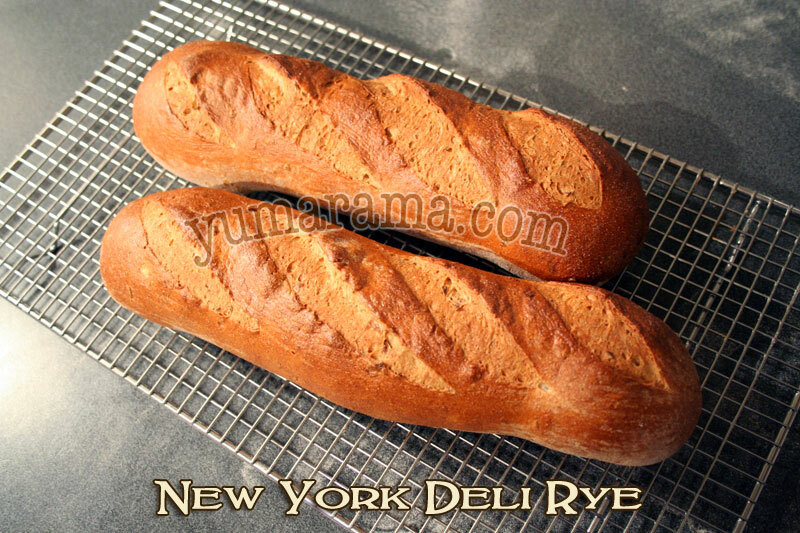 Since the rye flavour is still pretty subtle even though I used the bolder dark rye flour, I would imagine it would be REALLY thin had I used white rye. This is still only a 45% rye loaf so it’s primarily normal bread flour. The crust is crispy but light, at this point. It will of course change once the bread has to go into a plastic bag. But I think even Punkin, who dislikes crunchy crusts, might approve of this, if he weren’t away on a business trip. So yes, this rye bread is very good and makes up for the less exciting Basic Sourdough of last month. Other than the size issue – which was fully of my doing – I don’t see anything off about any of the process or the final product. We’ll see if the flavours intensify in the next day or so as sourdough usually does but I’d call this one a roaring success. I’ll have to pick up some corned beef or pastrami, likely some of both, on the way home tomorrow and give this a real Deli Sandwich test. This bread was submitted to YeastSpotting. 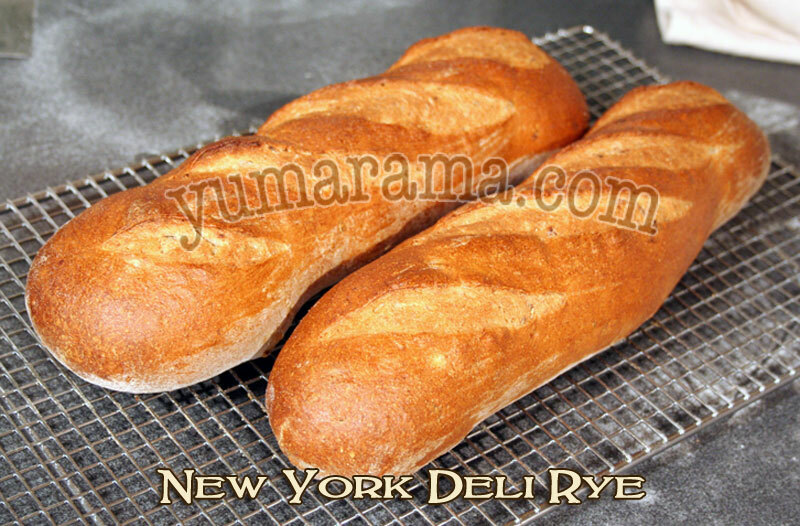 Check it out for great breads each week! Oggie of I Can Do That gave this one a top score all around. Anne Marie of Rosemary & Garlic felt it was rather weak in rye taste (I gather she used white rye flour). AP269 of Food and Family was pleasantly surprised that her kids LOVED it. These look perfect. 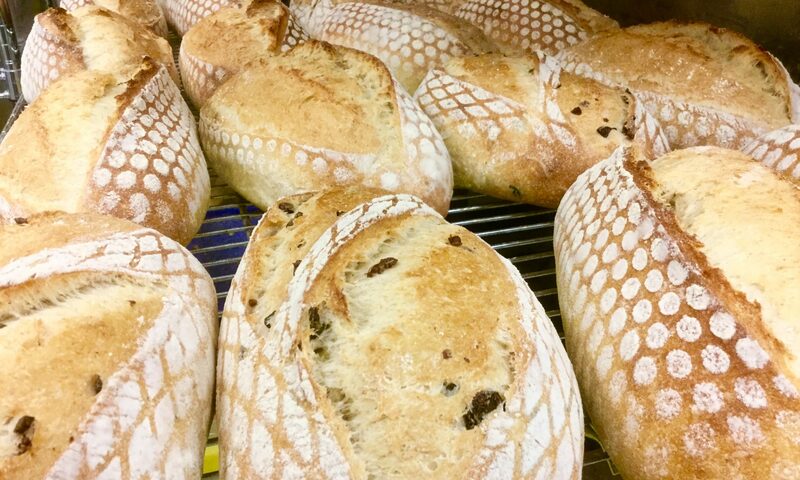 I like the batard style. 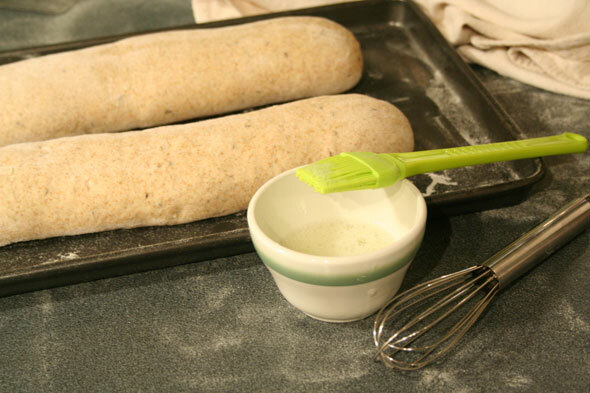 I haven’t had rye bread in ages and am looking forward to the slow and steady group making it. Great write up, thanks for the shout out. I gave a friend a link to your starter tutorial. Her husband had tried unsuccessfully to make his own, I told her that I knew of one that would really work. You are correct, I used the white rye and it was a tasty loaf, but not what I think of when I think of rye. Glad to hear the starter info is helping others out. I’ll look forward to their comments as they grow their new pet. I’ve now been chowing down the NYDR, in the form of multiple Montreal Smoked Meat and Corned Beef samidjes. Them one-pounder loaves don’t stand a chance! I would have been better off making a two-thirds recipe (two 1.5 lb loaves). Now that I’ve been munching on this for a couple of days, I’ll say that it’s a good loaf, although it’s not exactly “punchy” in the flavour department, rather on the subtle side, even with the caraway and onions and making it with the more flavourful dark rye flour. When combined with rather strong flavours like hot Montreal Smoked Meat, Ementhal and a healthy dab of Dijon, the rye flavour seems to mostly vanish into the background. I would have preferred something a little more robust flavoured that could stand up to these other distinct flavours. I should be glad I didn’t have white rye flour, it seems. So perhaps not my fave rye, but still good none the less. Excellent photo tutorial. I still have not had success with sourdough breads. I have to take a closer look at your starter tutorial. True, if you happen to be in the USA, that’s handy. Outside the US, however, options are rather limited. Sourdoughs still make me anxious but the flavor combo in this rye bread has got me thinking that I really can’t procrastinate trying them much longer. Great bread! I just love the shape of your loaves! Using white rye did feel kind of like putting one’s toes in the water instead of jumping in – the rye flavor was very mild in mine. 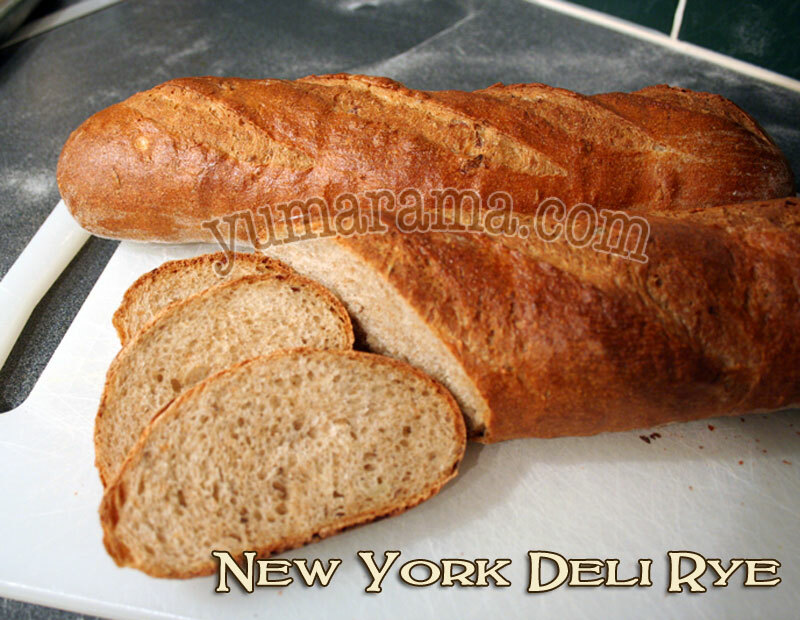 .-= Janice’s latest blog post: New York Deli Rye Bread =-.